I know - you're thinking this is too easy. Ace isn't really where the sign says he is. You are at the start in Chicago, not the end of the road in California. Ace would be at post 1933 at Jackson & Lake Shore drive in Chicago. Anonymous, both CA and IL are the start and the end; I don't know if CA has signs for this, but Il has both start and end signs. You're right though in that, in the general nostalgic view of 66, the flow is east to west - maybe it's the Grapes of Wrath legacy. Toltec, what you say would be correct if the sign was also correct - it isn't. Although Route 66 has ended at Jackson Blvd and Lake Shore Drive since 1933 when that bit of land was reclaimed for the Century of Progress Exposition, the "end" sign is placed at Jackson Blvd and Michigan Avenue, which hasn't been accurate since 1933. 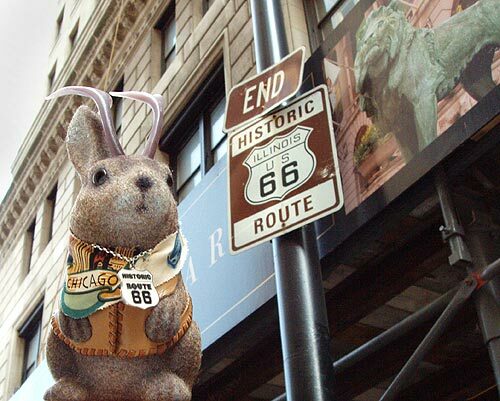 I do not know why this is the case; perhaps Chicago authorities don't want people stopping to photograph jackalopes at the busier Lake Shore Drive intersection? Btw, Toltec, feel free to tell us about yourself sometime. The name Toltec is taken from a river gorge in North Central New Mexico. I particularly enjoy the conveyance by which one can get there. I also enjoy Ace's adventures and surfing the net.